This modest web page is my repository for things relating to the Bondwell Model 2 computer. 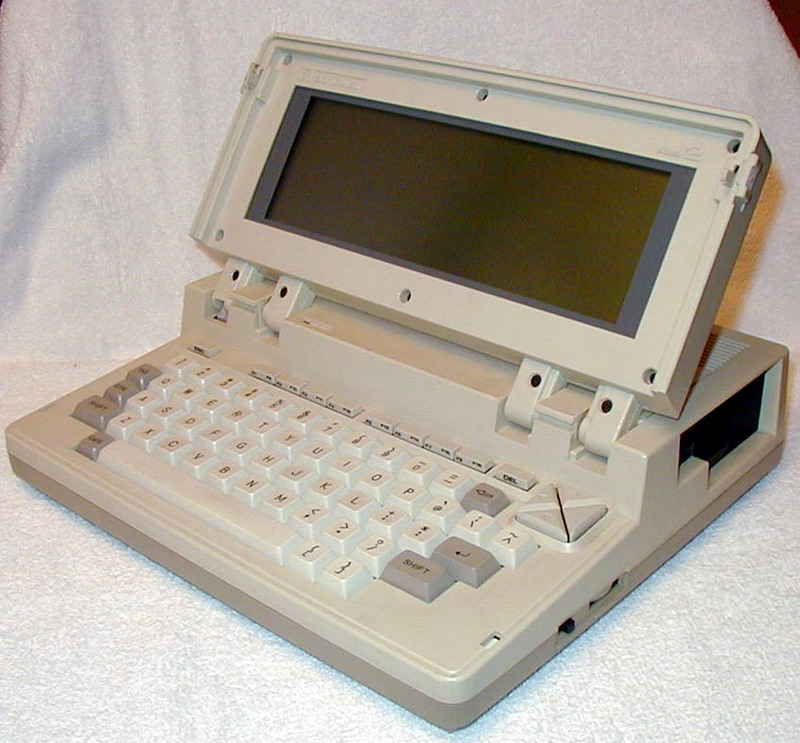 This machine was produced by the Bondwell Holding Company, LLC, of Hong Kong, and came out in 1985. It arrived an interesting juncture of the death of CP/M and the birth of laptop computers. 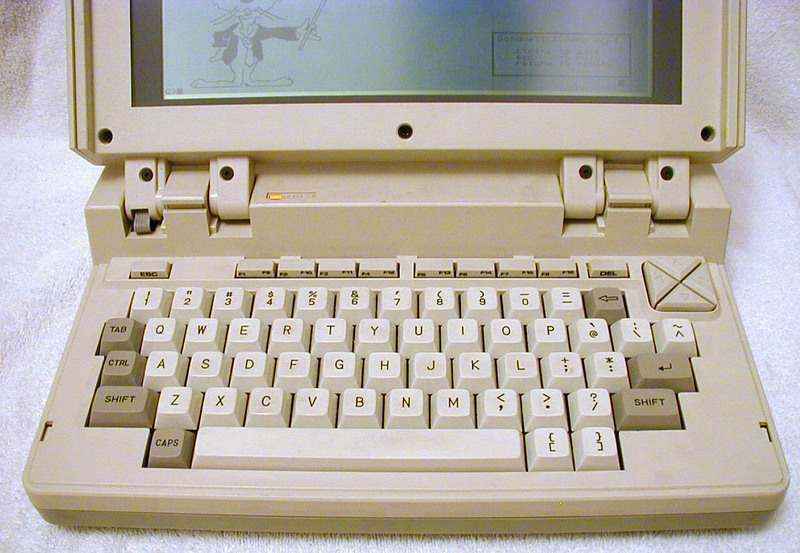 While there are earlier laptops and even earlier CP/M laptops, the Bondwell Model 2 came late enough that there was good enough LCD resolution (640x200) to support an 80x25 line display; CMOS chips were advanced enough to allow long battery life (up to eight hours), and 3.5 inch floppies were already commonplace. The only technology lacking from today's perspective is that this machine used two heavy 6V sealed lead acid batteries for its power source. Here is what is inside the case. Beneath the case is a single slot where an expansion cartridge can be plugged in. One such cartridge is the RAMCARD. 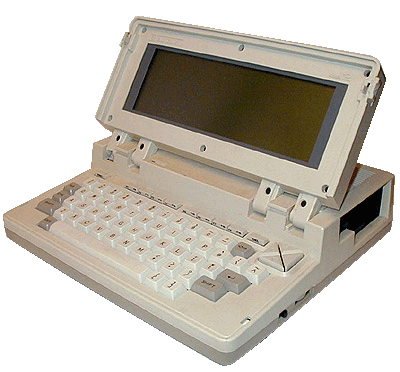 This contains up to 512 KB of DRAM and a 16 KB or 32 KB EPROM. 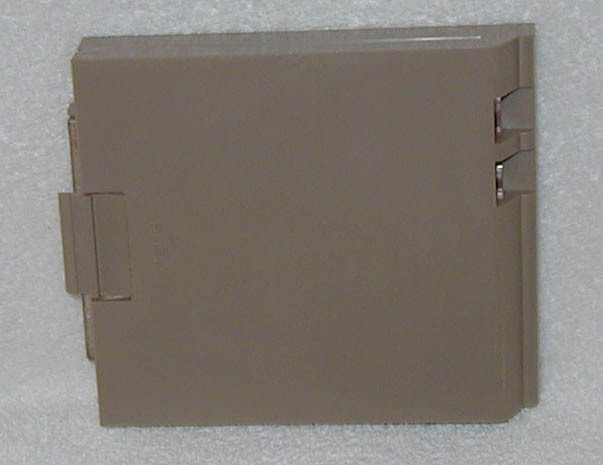 This extra RAM is configured as a RAM disk, and the EPROM contains code that configures it. In my case, this EPROM had been customized to contain three utility CP/M programs that automatically get installed into the RAM drive. 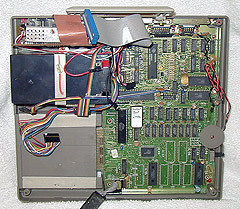 The rear of the machine has a fold-down door exposing three I/O connectors. One is for the serial port, one for the parallel port, and one for an external floppy disk drive. 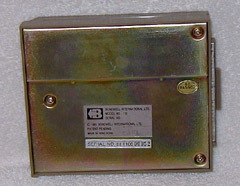 All use non-standard pin-outs to reduce the connectors' sizes. Note that the machine has more (with the RAMCARD, a lot more) than 64 KB of things to address. 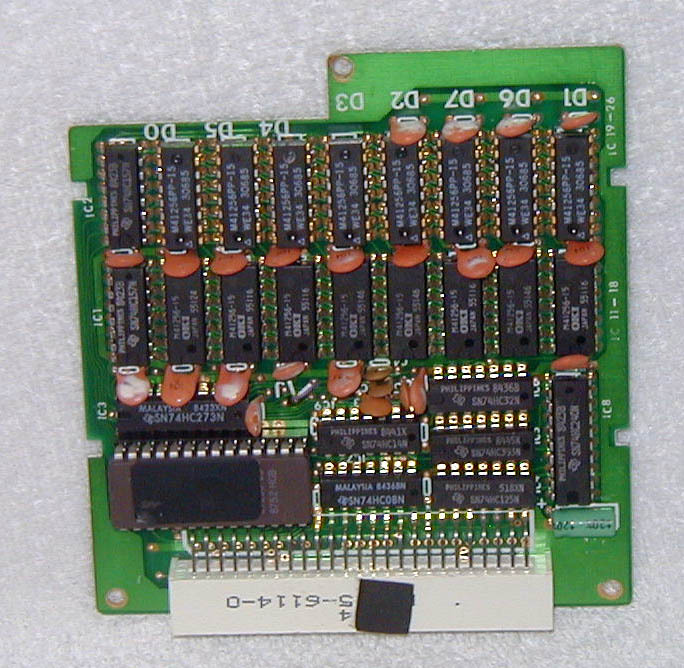 Three of the 8255 PIO chip pins are used to control memory banking. Memory is split with the upper 32 KB being fixed to always map to 32 KB of the 64 KB on the motherboard. 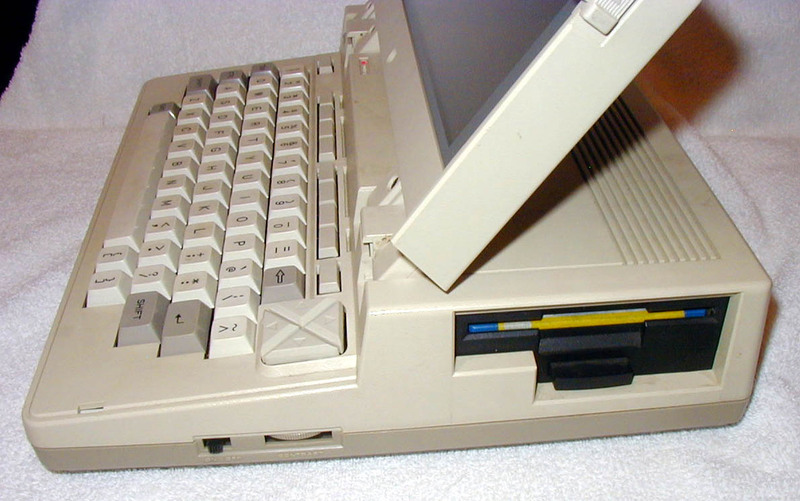 The lower 32 KB of the address space can be mapped to the other 32 KB of motherboard DRAM, or the boot ROM, or the video RAM, or the expansion slot. While the other six bank enables appear on the expansion slot interface, the RAMCARD uses one 32 KB aperture to write to a control register in the RAMCARD to provide more bank bits. 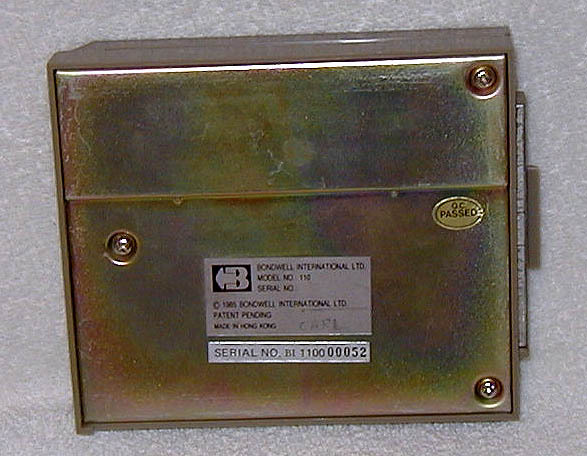 Without that second level banking, the RAMCARD would have been limited to 180 KB or so (six banks of 32 KB). The two 6V 3Ah batteries in my machine were dead, long dead. I replaced them both with a single 12V 3.4Ah battery; mechanically it is an identical fit and it was cheaper as well. As was mentioned, the graphics are bitmapped at 640x200. 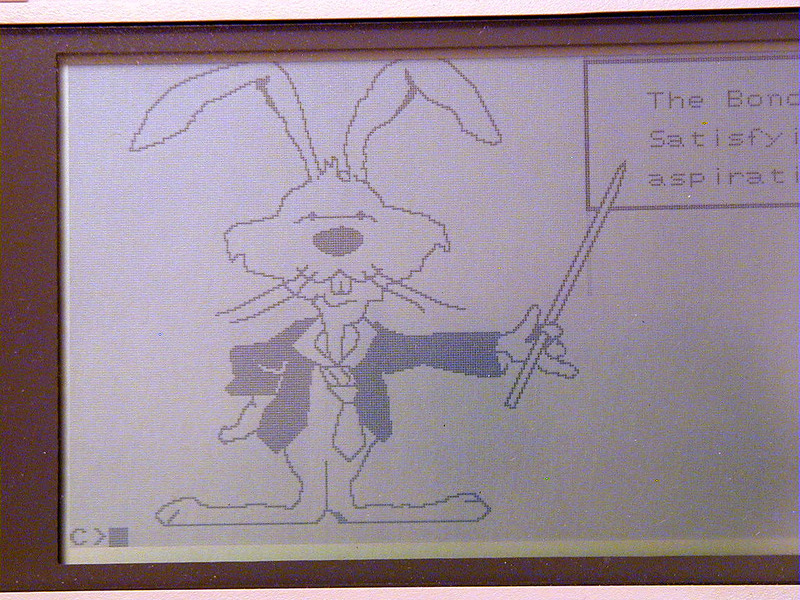 The text is drawn in software by splatting the pixels for the character so the appropriate place in the display RAM. As a result, text output is quite slow. TYPEing a document from the RAM disk on a 4 MHz CPU should tear, but on the BW2, it leaves just about enough time to read the document as it scrolls past. The Bondwell BW2 Technical Service Manual excellently documents the machine. It is 134 pages long. I obtained the manual from Howard Harte's site, but I added PDF section bookmarks and used more aggressive compression to make the file considerably smaller. I'm certain that this machine was sold with a User's Guide of some type. If you have a copy you are willing to scan, loan, give, or sell, please contact me so I can make it available here. 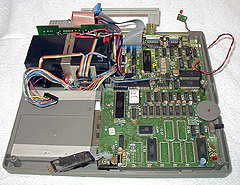 As mentioned before, there are two places where ROMs are used in the system. One is on the motherboard, and contains code start code and the character map. I have three ROM images, two from Bondwell, one custom. The custom version was done by a previous owner of my machine. It is based on a modified version of version 1.2, but other than that, I don't know how it differs. An EPROM also appears in the RAMCARD. Normally it supports a 27128 (16 KB) EPROM, but there is a jumper option to allow using a 27256 (32 KB) EPROM instead. Presented here are two RAMCARD EPROM images. The first is from Bondwell. 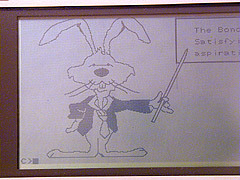 The second one is a version customized by a previous owner of my machine. I'm not sure of all the changes in it, but the most significant is that it installs three utility programs into the RAMDISK (STAT, PIP, and BU, a backup utility). I've heard from the internet (specifically, Mr. Christian Lesage), the custom boot ROM and the custom ramdisk ROM must be used together, and don't work in any other combination. Thanks, Christian! Below are the BIOS files from the CP/M System & Utilities disk that came with the machine. I haven't verified whether or not this source exactly matches what is being used in the system. 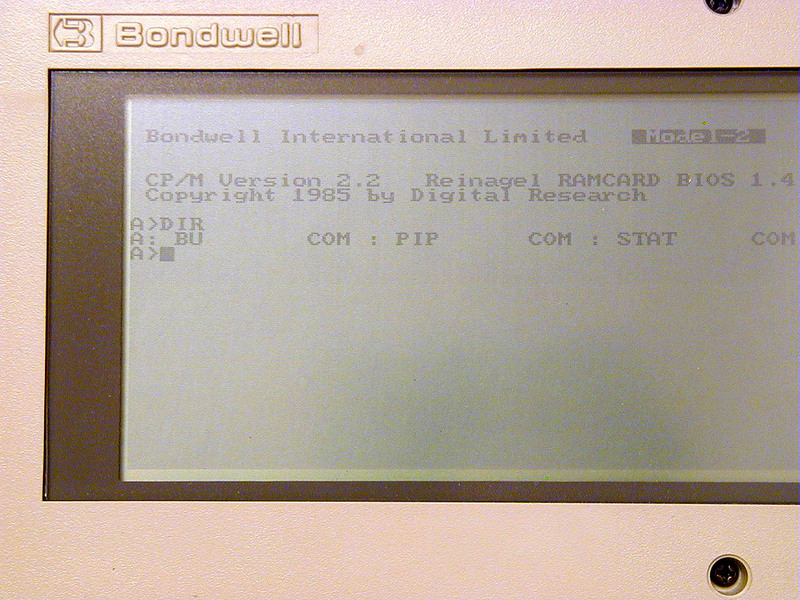 The Bondwell Model 2 came with a number of disks containing a CP/M system disk and various applications, such as word processing, spreadsheet, report generation, and database applications. Interestingly no programming language was provided, not even BASIC. Sami Rautiainen has a directory containing teledisk images for the BW2, although it is missing disk 1 of the Wordstar application disk (which I've sent to him). Teledisk is widely used to archive disk images for disk types that can be read and written using a standard IBM PC floppy disk controller (all of which are very similar to the NEC 765 FDC). However, teledisk is problematic. It hasn't been developed in more than a decade, there are a number of versions floating around on the web, and its legal use status is unclear. Luckily for the geek world, Dave Dunfield is on the case. He has written ImageDisk, a program to replace teledisk. ImageDisk uses its own format and neither reads nor writes teledisk images. 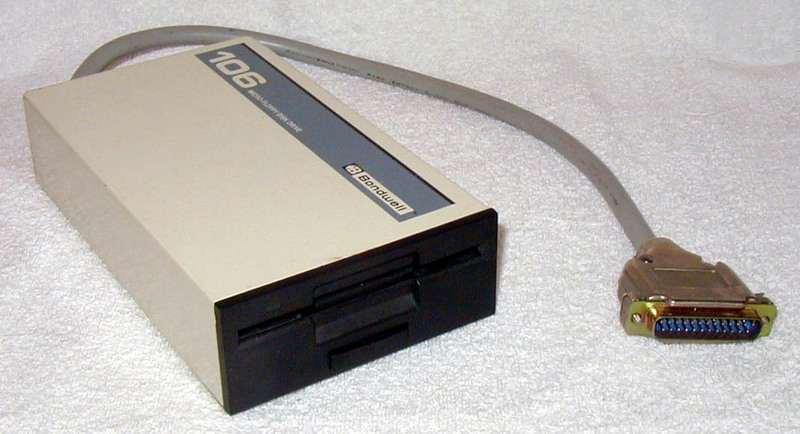 Various disk archive programs, including versions of teledisk, and the most recent version of ImageDisk are available on Dave's disk image page. Although I have made *.IMD ImageDisk images of all the floppies that came with my BW2, at the present time I'm supplying only the standard disks. At some point, after I've vetted the contents of the other disks, I may offer them as well. 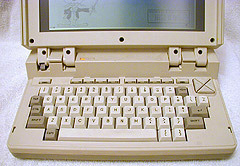 In case you want to see the Model 2 in more detail, here is your opportunity. 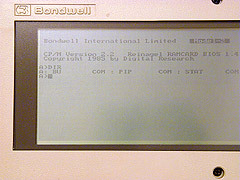 There are few other sites on the Bondwell Model 2 computer. Here is what I've found. If you want to contact me for whatever reason, try me at jim@thebattles.net. Back to Jim's Junk main page.